Health and safety has become a phrase which is normally accompanied by a long sigh. It presents stumbling blocks and often inhibits creativity. 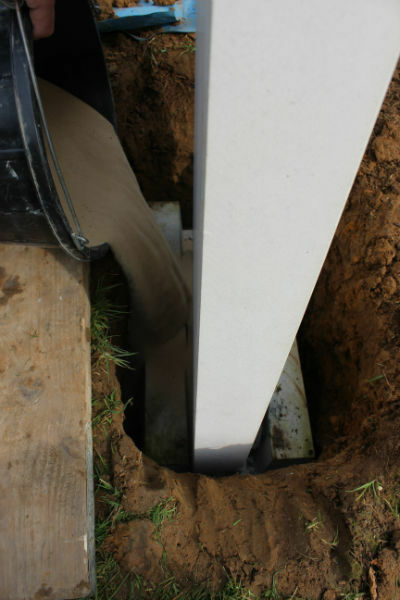 In a cemetery however it is a necessary precaution which protects against bad installation ( fixing) methods and ultimately helps to prevent stones from falling over and causing injury. A gravestone will inevitably move over the years as the ground shifts. It will lean and twist and sometimes fall over completely in time. Sometimes if a gravestone is installed too early and the grave is still sinking, it will lean forwards at a worrying angle. For this reason regulations have been drawn up by NAMM (National Association of Memorial Masons) which fixers of gravestones must adhere to. 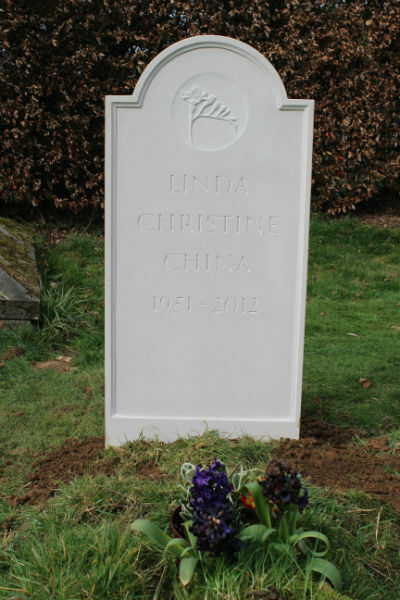 There are two main methods of gravestone fixing - monolith and dowel fixing. My preferred technique for fixing a gravestone is the monolith method, where approx 1/4 - 1/3 of the total length of the headstone is buried underground, and then set in a precast concrete shoe. 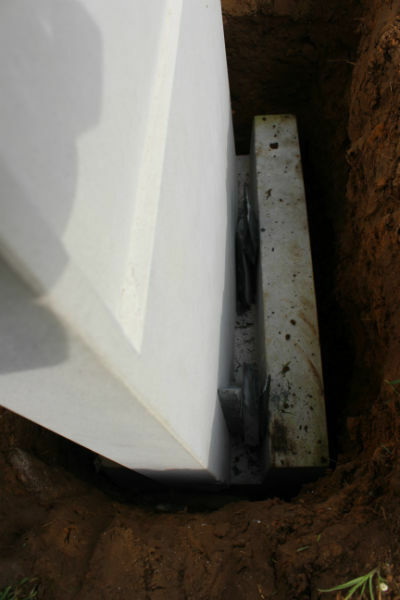 A dowel fixing is where the gravestone is fixed with stainless steel dowels to a base of the same material as the headstone. The base will be fixed to a concrete base. 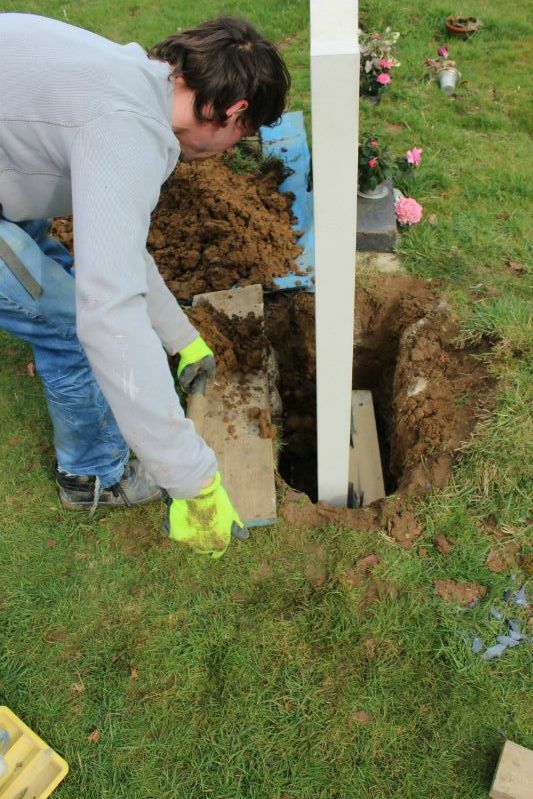 There will be a 'ground anchor' ( a long metal rod usually about an inch in diameter) connecting the gravestone to the ground between 12" and 24" deep. This method was partly introduced to replace the monolith method as fixers were putting less and less of the gravestone below ground (stone is expensive), and there was no way of policing this. At least a third of the gravestone should be placed beneath the ground. Here are some good and bad points about each method. They comply with practically every cemetery in the UK. 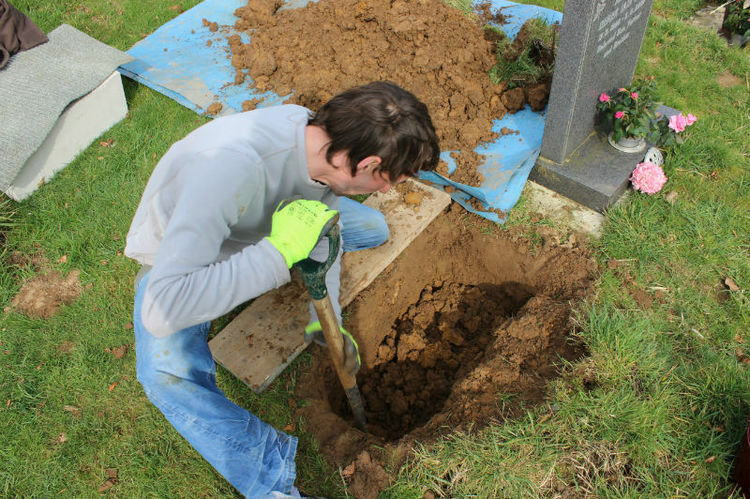 If the correct procedures are followed, it is extremely unlikely the headstone will ever fall over, although they will usually lean in time. The gravestone will be limited to a height of 3ft. If the gravestone leans there is little one can do to upright it. It is an expensive method because of the time they take to fix. 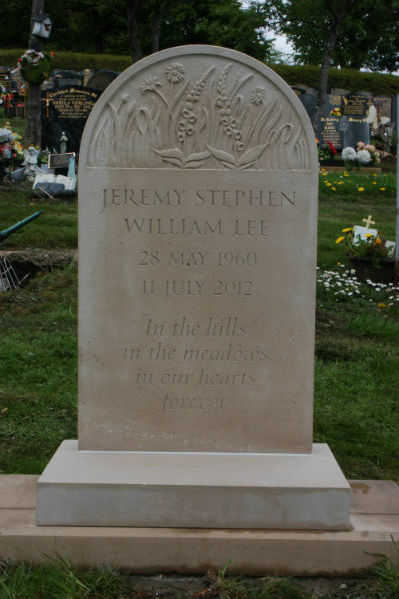 Gravestones look so much better coming straight out of the ground; nearly all my clients prefer this system. It is a traditional method and is sympathetic to British churchyards. The gravestone will be easy to maintain. If the stone leans in time, it is easy to upright it. They are cheaper to install. The gravestones are far more stable especially on a slope, provided they have been correctly fixed. One is not restricted to a certain height. There is a danger of the 'cowboy fixer' failing to put enough of the stone underground. Some cemeteries in the UK will not allow this method because of the above reason. Sometimes the cemetery will have already set a concrete beam for the dowel headstones to sit on. This is how we fix a gravestone monolith style. 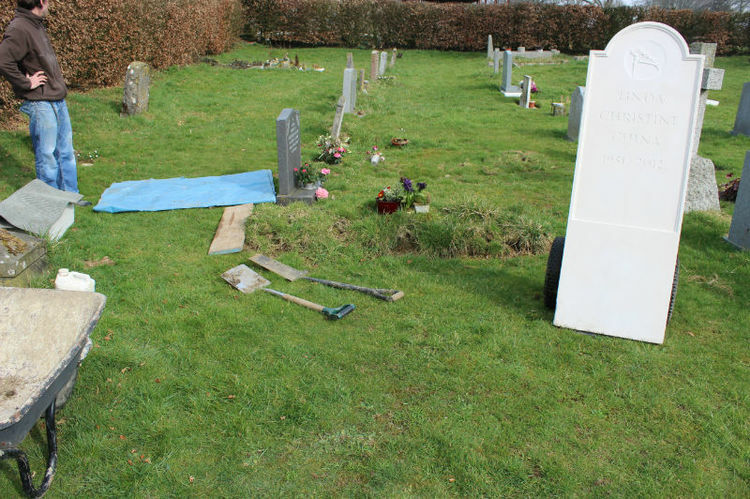 1.Measure the distance between existing gravestones and gauge the middle of the plot. 2.Place a short scaffold plank on the ground to mark the side of the hole and to prevent the ground from collapsing. 3.Start digging a rectangular hole large enough to take the concrete shoe. It is worth making the hole at least 2" wider all round, so one has space to move the shoe into position. The spoil will be put on a plastic sheet. 4.If the gravestone is to be say 3ft above ground level, I would bury a further 15" underground. The base of the concrete shoe is 4" so the hole must be 19" deep. 5.The concrete shoe will be lowered into position and levelled perfectly. If the ground is stony or clay, levelling will be tricky and it'll be difficult to stop the shoe rocking. At this point kiln dry sand can be poured in around the shoe. It will run into the spaces and create a firm platform. 6.Once the shoe is in place, a thick post is placed on the side of the shoe and a piece of carpet is placed over the plank. 7.The gravestone is lowed into the slot in the shoe (with a bit of practice, this does not need to be strenuous. One uses gravity to bear the weight at all times). 8.The levels are then checked and the gravestone is twisted if necessary, to line up with the other memorials in the line. 9.Slate wedges are then hammered into the slot in the shoe and the gravestone is set. Even without putting any earth back the stone should be firm. 10.The earth is put back into the hole and compacted. It is important that one periodically checks the levels of the headstone during this stage. 11.Turf is replaced where necessary. All reputable stone masons will guarantee their gravestones for ten years. It is not unusual for there to be slight movements in the stone during the first year, especially if the grave is quite new. 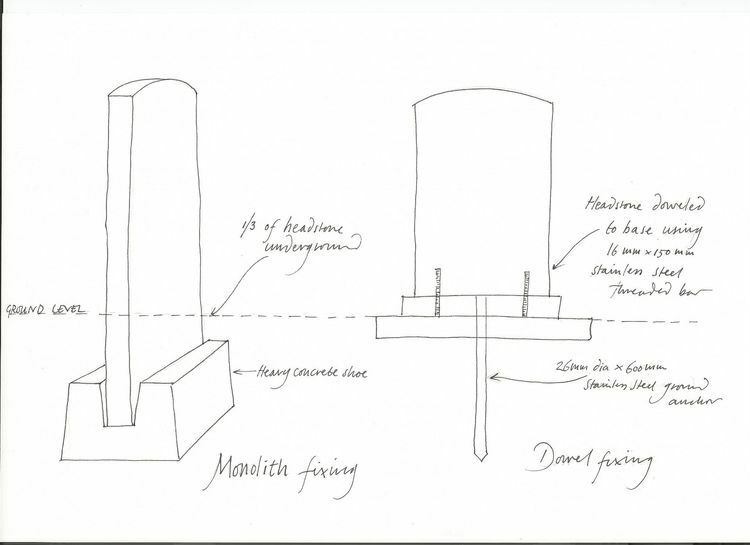 The headstone can be easily righted if the monolith fixing method was used.